What can I say, I am obsessed with fugly shoes. My work partner in crime regularly despises the footwear I lust over. I’m not sure what it is that draws me in. I am always partial to a fat, chunky heel due to the Bambi ankles – which I know I refer to a lot – but it doesn’t stop there. A very simple boot but a classic. 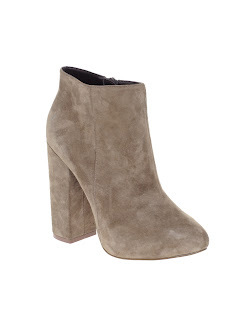 I love the sturdy heel, they light grey suede and the fact that I could probably getaway with wearing these all year. Yes please. Me and the work partner in crime have a shoe calendar on our desk at work. It will come as no surprise to know that I like the fugly ones. What’s wrong with a bit of fugly? "Pulling at my heart strings"